media conversion for music and video files, covering the broadest range of device and media player profiles. With integration with Facebook, Flickr, YouTube & Vimeo, you can effortlessly download, convert, and back up your social media content, or your most treasured videos. Power2Go 10 helps you keep track of all your burn projects. Every time you burn a disc, Power2Go adds that content to the Disc Manager, so you can easily tag, browse, and quickly find your files. You can even add a snapshot of your disc to make it easy to recognize. Mount a disc image file as a virtual drive on your PC for continuous access. Browse contents from ISO image files with a handy ISO Viewer. Grab files from ISO images as if you are reading files from a disc. Power2Go lets you make music discs for any occasion. From audio CDs for home players, to MP3/WMA DVDs with hundreds of songs, you have everything you need to keep the music going. You can even create original quality audio CDs from CUE files. Your video is in good hands with Power2Go. Create terrific-looking DVDs and VCDs using CyberLink’s award-winning authoring tools. Choose from ready-to-use menus and customize with your own music and text. Get more menu templates from DirectorZone! Create Photo Gallery discs that run on your PC. Easily browse photo collections or play slideshows complete with music. With support for text and Internet links, Photo Gallery discs are perfect for sharing family memories, company profiles, and product catalogues. DirectorZone is CyberLink’s video-editing community site where you can find and download resources for your video projects. Browse through an ever-growing library of custom DVD menus. Subscribe to your favorite creators and start your collection of downloads! With support for all popular media formats you can convert your entertainment files so that you’re not limited to enjoying them on only one device. You can even rip and convert the audio from video files. Easily convert UltraHD 4K videos, and even convert audio files or CDs to AAC (.m4a) format. Smart Detect technology means you don’t have to remember confusing file formats and resolutions. As soon as you connect your device to your PC, Smart Detect recognizes it and sets the optimal output formats and resolutions for converted media, ensuring you always enjoy your videos, photos and music in the best possible quality. ONLY Power2Go 10 Platinum comes with CyberLink’s easy-to-use System Recovery Wizard. Protect your system from hard drive failures or malicious viruses. Power2Go lets you create a full backup of your Windows system files and data. Using Power2Go’s intuitive System Recovery Wizard, you can create complete or partial bootable PC recovery discs on CD, DVD or Blu-ray discs, so that you never lose the data that’s important to you. Enjoy your favorite videos anytime. Search and download videos from YouTube and Vimeo to your hard drive, or burn them directly to disc to watch when you want. Securely back up, and be in control of your personal online content with easy backup from Facebook and Flickr. Burn encrypted data to CDs, DVDs or Blu-ray discs. 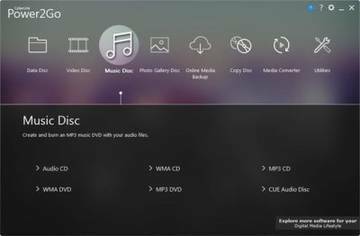 Browse encrypted discs with an easy-to-use browser included right on the discs you burn. Burn secured data discs with encrypted file names. The encrypted names are hidden from view until the correct password is entered.